You will get a range of prices for Basic, Middle and High-End kitchens - both materials and installation. This is the most robust and accurate Kitchen Calculator of its kind, available online. 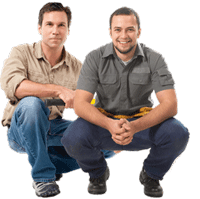 All material and labor prices are sourced from reputable contractors, working in various US regions, material suppliers and national chains, such as Home Depot and Lowe's. Thus, you are getting a price quote that will be very similar to what a local contractor would provide, after assessing your project. Get in touch with pros in your area! The majority of kitchen renovation projects include new cabinets and countertops. Cabinets are calculated by LINEAR FEET along the wall. A typical kitchen would have a 10*10 cabinets layout, or 20 ln. feet of cabinetry. This includes both the top and bottom rows. All prices include complete install and all hardware required for proper operation. 1) Enter the length of your cabinets (measured along the wall). 2) Enter the square footage of your countertops. Most counters are 2 feet deep. If that's the case, take the length and multiply it by 2. Add any counters that will be installed on the kitchen island. 3) Select the type of cabinets that you want installed (either new or refacing) based on quality of materials. 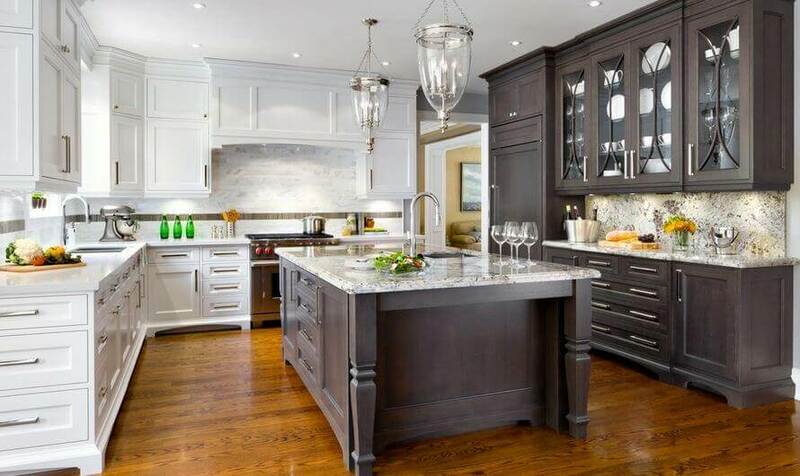 Note that "enhanced" and "premium" options include the Island, better materials and upgraded parts/trim/hardware, while "basic" only includes standard wall cabinets. 4) Select the countertop material of your choice. Note, that this includes standard installation and mid-level edge profile. For a more accurate estimate, use our kitchen countertops calculator, which gives you many more material options to chose from. 5) Select kitchen fixtures - these include: Sink, Faucet and Garbage disposal. There are 3 quality options. Basic package includes a standard double sink, an entry level faucet and a basic 1/2 HP disposal. Enhanced package includes a stainless double sink, a better quality faucet and a 3/4 HP stainless garbage disposal. Premium package includes a cast iron / enamel or copper sink, a very expensive faucet and 1 HP stainless steel garbage disposal. The first five options are standard to most projects. If you would like a more detailed estimate, click "Show More Options" button. This will display additional settings, such as: - Kitchen Appliances - New kitchen floor options - Painting the kitchen. Kitchen Appliances includes a refrigerator, a stove, range hood and a dishwasher. There are four options: Basic, which includes entry level appliances, enhanced, which includes better, stainless steel appliances, and high-end, which includes premium, built-in appliances. New Flooring includes a choice of 3 flooring materials typically used in kitchens: tile, hardwood or linoleum. Painting you will need to enter your kitchen size (ft) and ceilings height. By default, you will see cabinets and countertop prices, as well as the job total. If you add more options, the results will appear above the total cost. The formula we use assumes standard "NEW" installation. No custom work or removal of the existing kitchen or plumbing work is included. This calculator uses a special algorithm that looks at the "size of the job" and adjusts your kitchen remodel cost accordingly. For example, if your job is small - I.e. 8 sq ft of countertops or 70 sq ft of tile floor, there will be an add-on per sq. ft. This is typical in the construction industry, where you have to pay more for small jobs. If you are planning to redo your kitchen in 2018, it is important to know what kind of return on investment this improvement will bring. Knowing the average ROI of updating your kitchen can help you budget wisely. Ultimately, you should aim to NOT overspend, hoping you will recoup your investment after selling the house. Overall, renovated kitchens bring one of the highest ROIs in the remodeling industry, roughly 70% . Prospective buyers pay special attention to the look and functionality of a kitchen, and have very high expectations for this space. It is very important to realize that your return on investment will be affected by many factors, such as the housing market, value of the house, and type of updates you do. Interestingly, very expensive, high-end kitchen remodels have the lowest ROI, of only 60-65%. This is why it is very important to carefully consider whether its worth it to invest $50-60K or more into this project. While such an upscale kitchen may be a necessity when trying to sell a 2 million dollar home, it will not pay off for lower value properties. At the same time, minor updates that cost $12,000-16,000 have the highest ROI - an impressive 91-92% This is because making small improvements can go a long way in making a stellar first impression, boosting the home's desirability, and raising the sale price. Pro Tip: you get the highest returns on redoing a kitchen when you spend between 6-12% of the total home value. Yet another key to maximizing your ROI is being in tune with the particular trends of your local real estate market. Depending on where you live, prospective buyers may prefer a specific kitchen style, a countertop material, a particular brand of appliances, etc. Not seeing this in a kitchen can lead to disappointment and ultimately loss of a sale. Overall, it is best to consult an experienced local real estate broker to find out the exact preferences of home buyers in your area. I guess you’re right. I hope it will be here for a long time and not disappear like the other sites. Joey, this site is not going to disappear, i promise! PS – which “other sites” do you refer to? I’m not sure how your calculator works. I entered the required info and hit the calculate button, but nothing happens. This would be very useful for estimating a basement remodel that I will be doing in about 4-5 months if I could get it to work? Lee, sometimes there is a delay with PHP script that processes the kitchen cost calculation, if there are too many site visitors at once. Try it again. Just a question. How could premium built in appliances (fridge, range, and oven) estimate at $5,400? It seems like that should be at least double to triple based on retail prices I’ve seen. Would wholesale or direct prices for contractors be discounted that much? A remodeling calculator is one of the best things a home owner can have when they are planning a remodeling project. It is very important to maintain the right balance between luxury and cost, when remodeling. I’m looking at complete remodel on a distressed property. This website is a great way to quickly analyze renovation cost. Simple and everything in one place. I was looking for cabinet refacing information. Thanks for the reminder that my kitchen is my homes money maker.